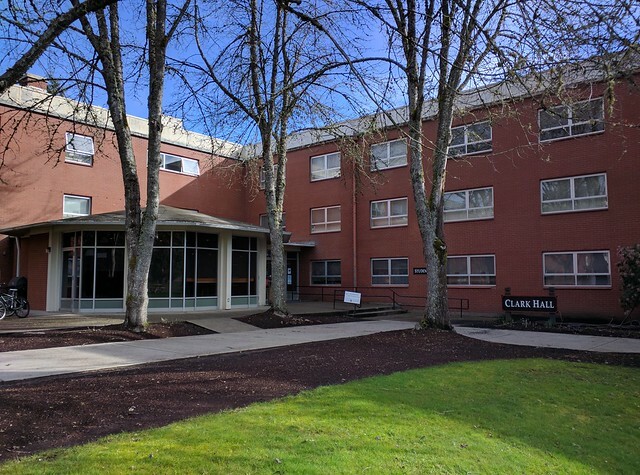 Constructed in 1966, Clark Hall is one of the historic residence halls on the Forest Grove Campus, named for pioneer and Pacific University founder Harvey Clark. With single, double and quad rooms, along with community lounges and kitchen, Clark offers a traditional residence hall experience for students that are generally 18 years old and older prior to the start of the Fall term. Clark Hall is a traditional residence hall with gender specific floors. Clark is made up of single, double, and quad rooms, with gender specific community restrooms. This residence hall houses students that are 18 years old and older prior to the start of the Fall term. Main floor lounge with a pool table and foosball table. Laundry ("Soap Box") room (machines are free).